The following list of items are my current favourite ways to be productive on-line and on the web. There are lots of people on the internet trying to help you! They make some fantastically useful tools and they give them away for free! They hope to make their money back with advertising (eg. Google), or when you sign up for the paid version that has extra features. But the free versions can be really useful without ever having to upgrade to the paid version. These are my favourites, in all cases I use the free versions. The only tip that might cost you some money is the dual monitors suggestion which will have varying costs depending on your current set-up and what you might need to buy to convert to using dual monitors. 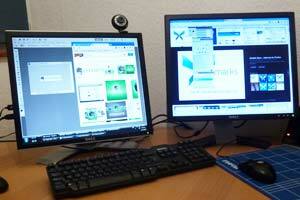 My first suggestion isn't actually an on-line resource but just a practical suggestion: Use dual (or more) monitors. It makes life so much easier. For example as I am writing this blog post I have a "view" of it open in my second monitor which I can refresh occasionally to see what my post will look like when it is published. You simply have more space to organize your stuff and can avoid "alt-tabbing" between applications. For me dual monitors come into their own when I am using Photoshop or Illustrator, I can have the graphics in one screen and all the tools in another, which speeds up my productivity no end. This will work with any software that has tool panes. I often open up my email client in two browsers so that while I write an email I can search for previous emails and reference or cut and paste from those. There are so many ways that having that extra space helps my productivity that I really miss it when I have to work on just one screen. It feels frustrating, restricted and almost claustrophobic! But how do you set up dual monitors? Well it can be easy, but it can be tricky so I have devoted a whole separate blog post to it: How to set up dual monitors. Toggle is a tool that helps you track what you are spending your time on. It's really straight forward to use, and very easy to set up. You simply register, set up your clients then set up the projects you have with each client. When you start work on a particular project click the Start button when you have finished click the Stop button. Don't worry if you forget, it's easy to change the times by hand later or add entries manually. So if you are out of the office you can add your entry for that time period at a later date. Then at the end of the day, week, month or whenever you have a nice list of all the projects you have been working on and and the exact amount of time you have been working on them. And you get a nice graphical representation of what you have been working on. The paid version allows you to set billing rates, have task hierarchies, have teams larger than 5, integrates with Basecamp and other products, and share reports with customers and colleagues; and only costs $5 (£3) per month. When I started using Toggl I ran it in parallel (to compare it) with a product called Harvest (http://www.getharvest.com/) which does exactly the same thing and had more features. It's paid version is $12 (£7.30) per month. And there is a "Free Plan" to use, but it's easy to miss when your trial period ends (it's at the bottom of the "Choose Your Plan" page and isn't highlighted). In the end I went for Toggl as I didn't need the extra features that Harvest supplied, and I liked the interface slightly better. Another similar product is RescueTime. This is similar but it software that you install on your machine and it runs in the background. It records everything you do. You then log in to the website and it gives you details of exactly what websites you have been browsing and what software you have been using. You don't have to do anything and you forget it is even running. Also, you can make notes with Toggl just before clicking start so, at the end of the week or month, you know what you were working on in fine detail for each project. With RescueTime it might show you having spent 10 hours on Gmail for example but you don't know why. With Toggle I can break it down, for example at the end of this week I will see that I was writing an email for 10 mins to you as part of my project X for client Y. At least that's what they claim. And I have no reason to doubt them as I have found it really useful myself. Evernote is a cross platform note taking app. You can make notes on your smartphone, iPad, tablet, laptop and desktop. You can type in the notes, record audio, take a photo, upload PDFs and take "web clippings". As soon as you make a note it is saved to the cloud and is available to all your various devices that have Evernote installed. You organise your notes in notebooks and you can add multiple tags to any note. This makes it possible to arrange your notes in lots of different ways and list them under various categories (tags). It's like having a really well organised filing cabinet of all your thoughts, ideas and reference materials at your finger tips. And this is all backed up by powerful search functionality. The tag line of Evernote is Remember Everything. And there are lots of different ways to use it and remember your ideas, and reference materials. With a little thought you can organise your notes to suite your business and the way you generate ideas or organise your projects. I personally use Evernote in conjunction with a methodology called Get Things Done (GTD). I talk about GTD on the TLC Office Supplies website blog. I use the free version of Evernote, and that is all I have needed but there are paid versions that have more features. The paid versions are really cheap $5 (£3) per month or $45 (£27.50) per year. This gives you more upload capacity and the ability for search to include looking in your scanned PDFs and images (it uses character recognition). And there is a business rate of $8 (£4.90) per month per user which allows you to share notebooks. I've been a user of Gmail since the outset. I've set up other email addresses in Hotmail and Yahoo but have never been tempted to use them as my main email client. Gmail has always performed really well for me, emails arrive really quickly and the spam filter always seems spot on whereas when I've used Yahoo and Hotmail accounts there have often seemed to be delays and mis-diagnosed spam. Four other reasons why I'm sticking with Gmail for now are: i) I can run multiple emails from one account; ii) I have 10 seconds to undo a send! iii) I can save canned responses; iv) I can click on dates in the body of received emails and it puts it straight in my calendar. If you want to find out how to do these things go to my favourite Gmail features. The other advantage of having a Gmail account is the fact you then have a Google Login that allows you to use all Google's wonderful free tools: Google Analytics; Google Webmaster Tools; Google Apps: Spreadsheet, Word Processor etc. ; and Google's Calendar. And all this great stuff works on any computer that has a web browser, it's free, there's no software to install, no licence fees to pay, and it's all saved in the cloud. If you want to run a lean business, Google Apps are a great choice. Then there's Google Drive. Simply install it on your computer and any files you copy or save there are instantly backed up in the cloud, on Googl'e servers, edit them, save them, they are backed up. Install Google Drive on another machine and you have multiple backups. And finally if you have a Google account and a website that's important to your business you need to set up a Google Plus profile. The reason you need to do this is that you can link the two, and when they are linked you can get your profile picture to appear next to Google's search results when your site appears; and when users see a profile picture next to search results they are more likely to click on it, and therefore more likely to become one of your customers. Xmarks is a browser plugin that allows you to synchronise your browser bookmarks across all the browsers you use on all your devices. Bookmark a site on one browser on one computer and it will synchronized on all your other browsers on your other devices. I use bookmarks a lot to organise the work I am doing, the websites I need to work, and the resources I need to refer to; and I also work on a lot of different machines, and have to test the websites I build on all the different browsers on lots of different operating systems. Xmarks gives me consistency across all those different environments to get to the resources I need quickly. 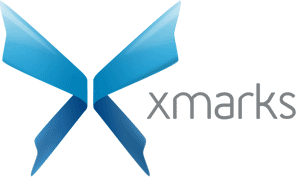 And if you ever find yourself somewhere without one of your own devises, say an internet cafe on holiday, or round a friends house, you can log in to the Xmarks website and your bookmarks will be available to you there. What free on-line tools couldn't you live without? Also, please take a look at Kanban Tool - a virtual time management board for planning, organizing, analyzing results and real-time collaboration. OK, will check that out, at first glance looks like it has more features than I need at the moment.